We set out to do something different; to offer birders birdwatching expeditions which are far from the ordinary, customised, unique, relaxed, energetic, bonding and indulgent vacations for individuals and families. It seems a lot of people like their birding Tours that way. People have trusted us to design exciting, fun-filled vacations for them, their families and others. We can “tailor-make” a bird watching trip that will linger in a lifetime’s worth of memories. On our tours you will visit birdwatching spots untouched by mass tourism, have endemic, endangered, and restricted species, and fun with new friends from around the world who share your sense of adventure. Take some time and look at the attractive range of Tours/Safaris and Excursions we offer on our website. We are very flexible and want you to get the most out of your birding time. Just tell us exactly what you have in mind, and we will be happy to arrange something for you. A trained and professional bird guide is essential for any bird watching tour; our guides are chosen very carefully on merit. They are personable, knowledgeable with interesting academic and professional backgrounds who have all the skills to conduct an extended birding tour professionally and to make sure every individual has a great time. 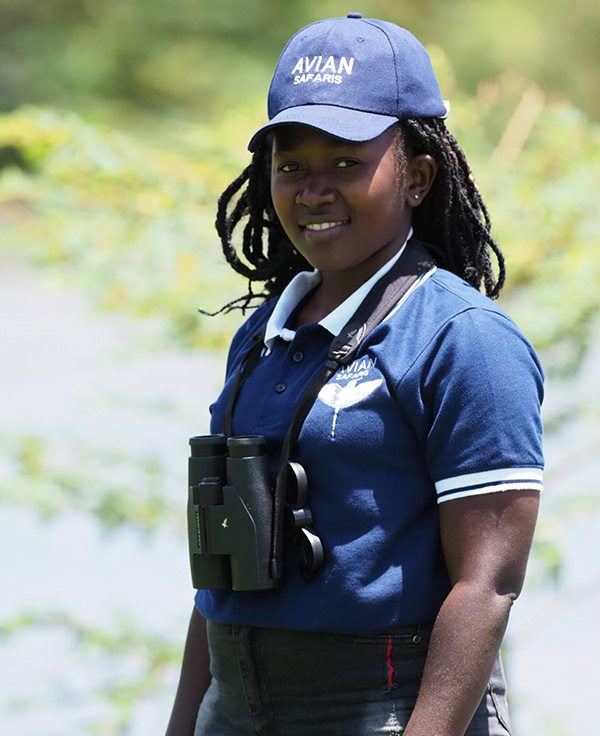 Our Knowledgeable Birding guides fluently speak English, and there is hardly a question they are likely not to answer. They will guide you on your excursion, tour, safari to all the birding spots included in the itinerary and work to the best of theirs for every member of the group to see a specific bird at a place. Their expertise guarantees leading you to sought-after species, hence an excellent experience. Please note that a knowledgeable guide is a key to the success of any organised birdwatching trip, and for independent birdwatchers with high expectations, hiring a local guide is highly beneficial because it increases the chances of seeing the less common and local species, contributes to the local economy and creates an incentive to protect birds. Tonny, the one with a perfect sense of humour, is a teacher by profession. A teacher who loves art a great deal and whose pieces have always been inspired by nature. Tonny has Crammy Wanyama to blame for abandoning his excellent job of transforming East Africa through teaching its people. After following Crammy’s social network posts, he believed these were the birds in their natural setting that he was meant to paint, he, therefore, started spending a considerable portion of his time in proper natural environments to get the best coverage of birds. In the process of wondering all over the country for the most exquisite paintings, birds behaviour dragged him to becoming a bird watcher more than a painter. 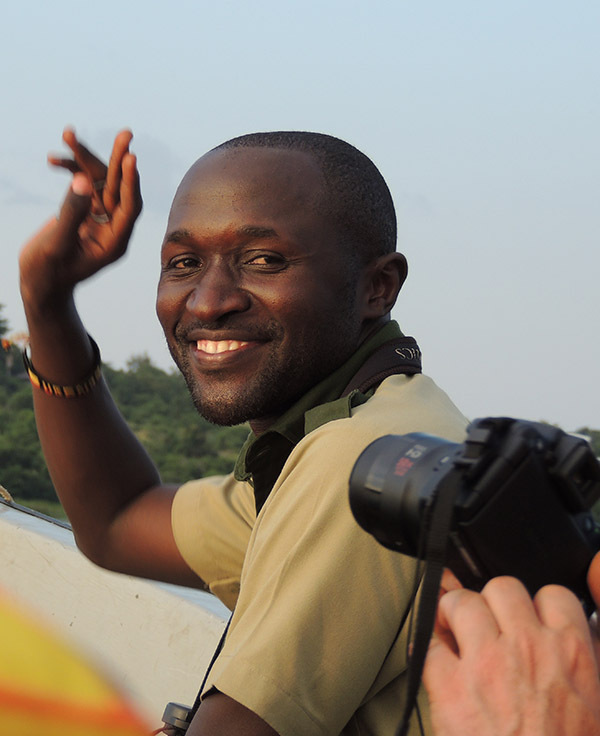 He started tagging on to Crammy’s scouting trips and also joined nature and conservation walks organised by Avian Safaris, Uganda Safari Guides Association, Nature Uganda, Uganda Bird Guides Club and many more. 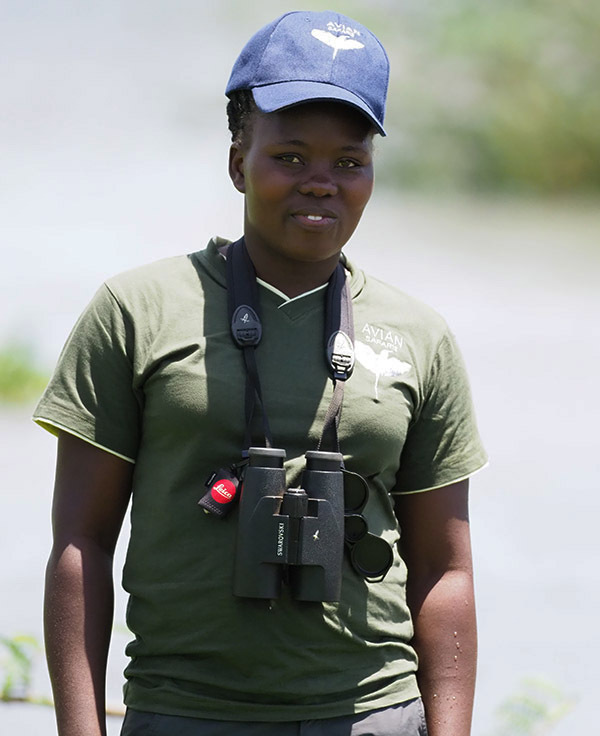 He has completed several pieces of training on birding and nature guiding that have been facilitated by the Uganda Safari Guides Association. Tonny enjoys driving, showing and teaching people birds; his sense of humour has always left a lot to be admired by our clients. 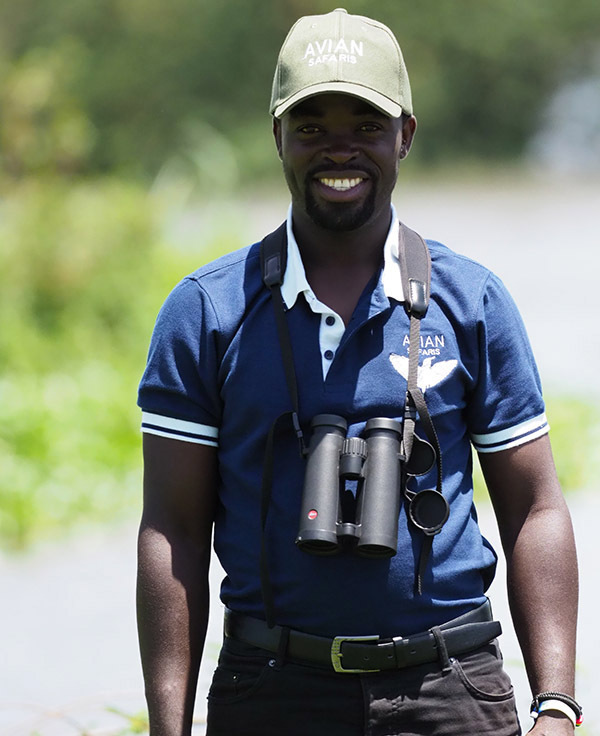 Meet Crammy Wanyama a passionate birder, born and raised in Uganda. His childhood attachment to birds haunted him to adulthood amidst his adventurous character. With his business administration transcripts and spending days in a squared building offering IT solution did impress him more than being out interacting with nature. At the end of 2010, he went for an introduction to guiding training that was arranged by the Uganda Safari guides association (USAGA). On the third evening of field practice, Crammy locked eyes with a duetting pair of Black-headed Gonoleks that patched less than three meters from him; this was the turning point. Anxious about the details of these birds, he came to realise that their kind of habitat is what his family and neighbours had wiped out in the name of agriculture and better human settlement! 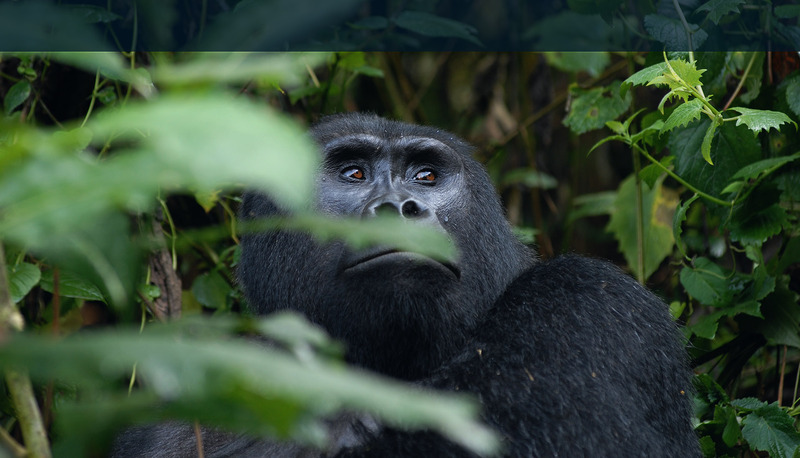 From this experience, he set 2011 a change of life year, he continuously read and attended a few conservation pieces of training to understand what he unknowingly would later share with his home people and birding clients. We know that great birding experiences require hours of preparation, therefore while designing Itineraries, we focus on individual or group needs. We provide skilled handling of all the technical and logistical details: securing the exact understanding of your individual or group needs and interests. We pride ourselves in the approachability of our dedicated and dynamic staff and the friendliness of the service which they provide. Our team is always available to respond personally to your comments if they are to place together a unique and satisfactory tour experience suiting your birding tour requirements. Please call or email our office at any time and ask any questions you would like to. You are going to find helpful and courteous service, and we always enjoy chatting with actual and potential birders, therefore, if you have any questions at all about our tours, then please get in touch. We want to hear from you. Having such a dedicated and efficient team behind you makes all the differences when it comes to having an enjoyable tour, both before, during and after the trip. We believe that Halimah has the most excellent communication skills. It is for this reason that she is going to be the one to respond to you when you drop us an inquiry. After her bachelor’s degree in Business majoring in accounting, she supplemented her professional skills with communication training. She manages our books alongside putting together outstanding travel plans. She loves nature and travelling to explore places and a very leisurely birder. In her six years of birding, her world list stuck at eighty-six species, the rest of it is just looking at nature’s beauty and move on. Consistent, high-quality services cannot be provided at a significant discount although we are dedicated to providing quality and satisfactory tours and excursions at prices which are affordable. Contact us for a quotation; you will not be disappointed. You will find our sales consultants friendly, supremely knowledgeable and prepared to go that extra mile to ensure you have the most excellent tour at the most attractive price without compromising on the experience. When you contact us, you will have direct telephone numbers of your consultant throughout the booking process. 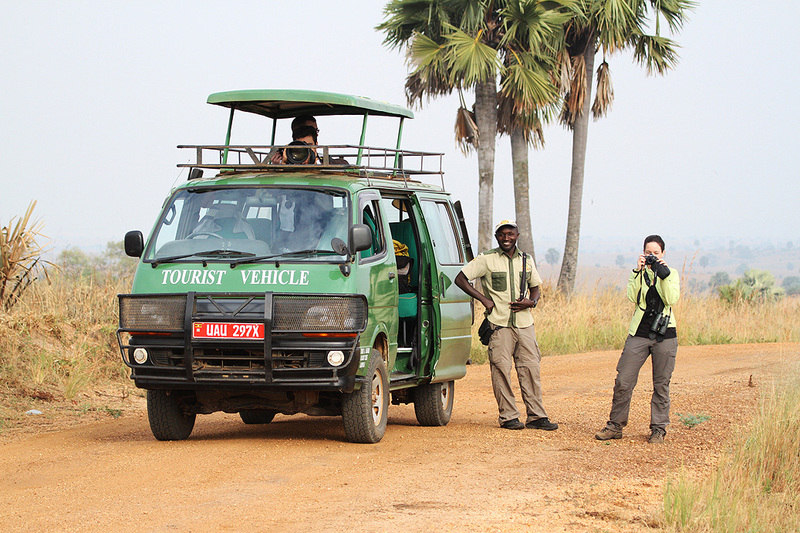 Avian Safaris is a Ugandan fully registered business and bonded tour operator (No. 187156 in the index of registration), so you can be sure that all payments made to us in advance of your tour are adequately protected. It might be quite difficult to let you know how important it is to book your tours with a reliable company. It may cost a bit more, but a financial failure that leaves you with a severe problem is far less likely. We are such a credible tour operator company in the country; this is evident from our strong ties with the prime stakeholders in Uganda’s tourism industry. Not only are we corporate members of Nature Uganda (NU)- a branch of the East Africa Natural History Society (EANHS), Uganda Safari Guides Association (USAGA)- The umbrella association of guides and guides clubs in Uganda, Uganda Bird Guides Club, Uganda Cultural Guides Club, but also in good books with Uganda Wildlife Authority, Uganda Tourism Board along with several others. 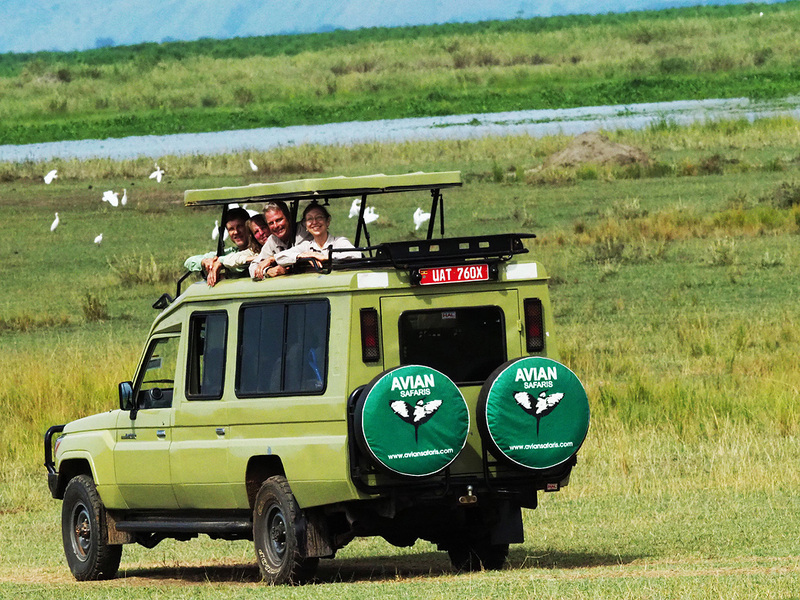 At Avian Safaris, we have low group size limits of any extensive birdwatching tour. Our Off-the-shelf tours of six (6) individuals will bread a quality tour since better communication is assured and there are higher chances of seeing birds clearly and firmly even when birding in Uganda’s Rain Forests. We operate with a variety of hotels which have been carefully selected on merit and frequently checked to ensure they meet our rigorous standards, many have been chosen for their commitment to sustainable tourism. As well as location, our selection also reflects our personal preference for places with character where the owners and managers like to engage with their guests. We have contracts with a significant number of Uganda, Kenya and Rwanda hotels; this means we can pass on substantial savings to our clients and also guarantees us control to ensure the content and quality of your stay is of acceptable standards. We have 4×4 vehicles, suitable for a variety of road conditions and game drives with ‘pop-up’ tops to maximise birding and Game viewing even in the savannah amidst the wild beasts. All vehicles have seat belts, a window seat for every member on board to enjoy great views and do photography and the comfort of all passengers. They all have a ‘no smoking’ policy. 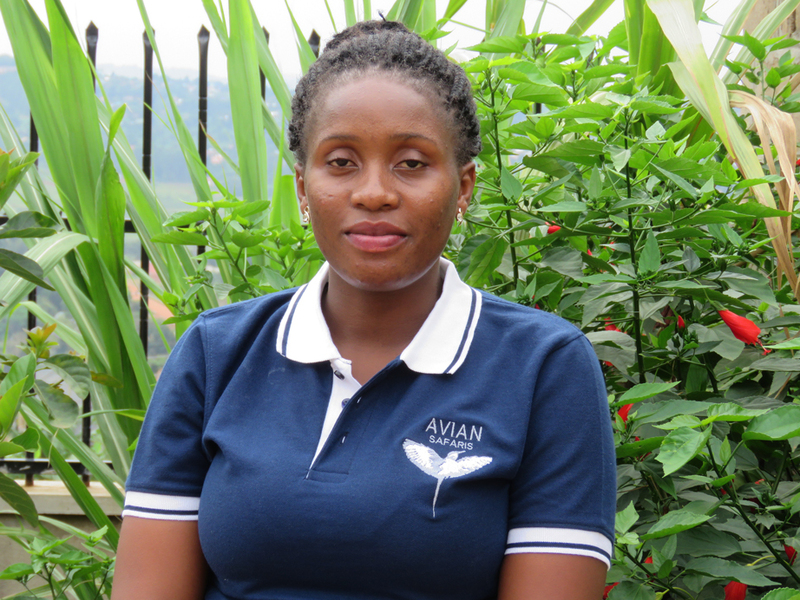 We aim at establishing ourselves as a niche player in the private sector of Uganda’s avian tourism. By participating in conservation programs and organising trips that give our guests the best travel experiences. Internally we intend to create and nurture a healthy, exuberant, respectful, and enjoyable environment, in which our employees are fairly compensated and encouraged to respect the clients and the quality of the service we provide. Also, follow-up will be mandatory to ensure client satisfaction and make any improvements as recommended by the clients. We seek fair and responsible profit, enough to keep the company financially healthy for the short and long term and to fairly reward our employees. We exist to provide a valuable service to our clients, a rewarding opportunity for our employees, and profitability to our shareholders. We believe that success in this endeavour depends on our employees. Satisfied employees lead to satisfied clients, which leads to pleased shareholders. To achieve this, we enable our employees to act with an entrepreneurial spirit, and we value those willing to take responsibility for their actions. We treat employees as family, which fosters intimacy, informality, healthy relationships, caring attitudes, and it makes work more fun. We treat employees with respect, which encourages them to treat each other and every client with respect. We want our clients to experience a legendary service that makes a lasting impression. Providing exceptional value to clients requires hard work and concentration. Hard work is most effective when processes are simple. Simplicity reduces costs and speeds processes. We believe in doing things right the first time, therefore do not cut corners. We take pride in our efforts as well as the rewards. Throughout this endeavour, safety will be the over-riding force behind any decision. On our tours, our clients will travel in security and confidence, with professional and personable tour guides. Through their commentary, they should be able to have an in-depth look at the tour activities and the country with its people. Continuously provide enjoyable quality excursions, tours and safaris on time and budget. Develop enthusiastically satisfied clients all of the time. Establish a market presence that assures short-term and long-term profitability, growth and success. We are fully committed to supporting the growth and development of sustainable tourism. Contribute positively to the communities in the tourist areas and wildlife Conservations.